This entry was posted on 12th March 2014 by The Salon Look Girl. It’s the time of the year again to show the most important women in your life, just how much they mean to you. Coming up with gift ideas for your mothers can be frustrating and worrying to many, a lot of us want to make sure we pick the perfect gift. So I thought this year, I’d help you out and give you some gorgeous gift ideas, which she will love. The beauty of gift sets is that not only do you get fabulous products but for a fantastic price – win, win for both you and your mum! Filled with anti-ageing skincare products for 25+, don’t be afraid of giving an anti-aging gift box as these products leave skin feeling wonderfully soft, subtle, and smooth. The gift box includes three amazing products- a lavish collagen cream, formulated serum and a deep exfoliating resurfacing cream. Give your mum the gift of beautifully soft skin! This gorgeous pamper kit is full of everything a girl needs for her nails! 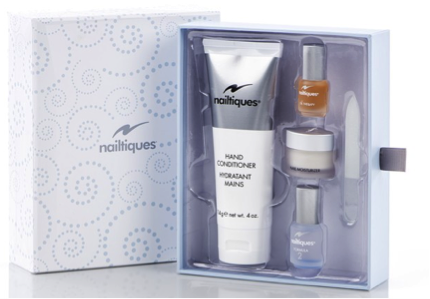 The famous Nailtiques Formula 2 helps you keep strong nails. The lovely moisturiser is grease free and nourishes and conditions your nails. Nailtiques Oil Therapy is also provided to help protect your mum’s nails from everyday problems such as washing up. Finally included is the Nailtiques Hand Conditioner, which includes a combination of jajaba and pure aloe oils in order to rehydrate and condition your hand and cuticle area. This set prevents nails from chipping and splitting by caring for over worked hands and keeping them in top condition. An at-home manicure answer! This set of gorgeous candles are perfect for any mum. This limited edition trio of soy candles are fragranced with Kevin Murphy's three signature scents; FRESH with the fragrant oils of Geranium and Pink Grapefruit Rejuvenating YOUNG with essences of Orange flower and Lemon Balm, and, finally, the heavenly scent ANGEL which is infused with Chamomile flower, vanilla and tangerine. Finally, why not give your mum the gift of the blue bottle? I don’t know anyone who doesn’t love it! This gorgeous set comes with the must-haves in a fabulous bag. The combination of these products guarantee silky smooth locks completely frizz free. Your mum can get ready without having to worry about any annoying fly-aways! Whatever gift you choose this Mothers Day, ensure you spoil your mothers rotten, it’s the one day they feel like they can relax!